It’s a beautiful day in the garden. 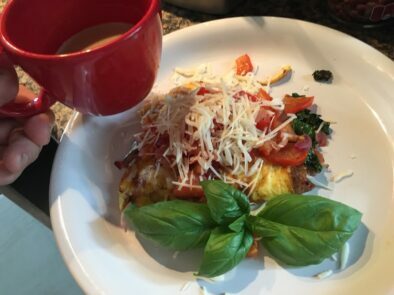 In this post I share my Italian Farmers Market Omelet Recipe. 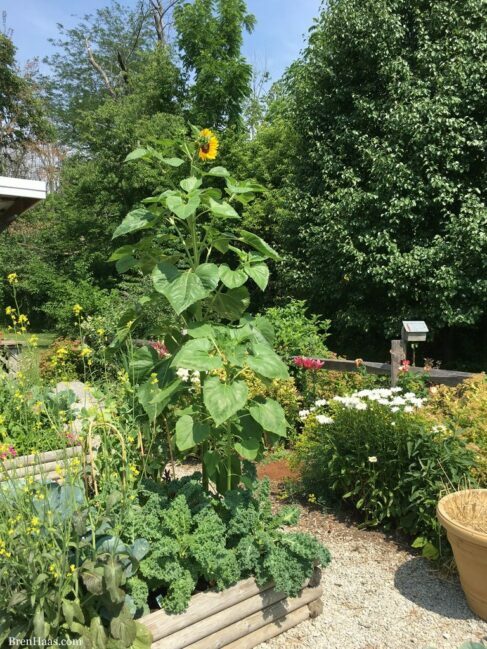 What a wonderful surprise this morning to walk out to the raised bed gardens and find the volunteer sunflower blooming. It appears to be towering over the greenhouse and garden shed in this image. It’s going to be a busy day in the garden so I wanted cook up a brunch that would hold us over until a later dinner when the sunsets. Thinking caps on …. what is a tasty, vitamin packed veggie growing in the garden today? KALE!!!! In this post I will share a tasty recipe I created that includes the super food kale. I decided to call this recipe Italian because of the ingredients and farmers market because it is what I imagine Italy to be like. Sunflower towering over the garden this morning! It’s a hot and muggy day in Ohio so it’s important to water and pick veggies early in the day. Picking kale in the home garden this morning. In the images above check out the kale growing under the giant sunflower that volunteered to grow in that location the same time the peas were being planted. I’ve never grown a sunflower that early. When picking kale for a recipe that will be lightly sauteed I like to pick the new baby leaves toward the bottom because they seem to cook up easily. Too toasty outside already before noon to enjoy the meal on the deck I cooked it up and we ate indoors. I’m excited to share this recipe with you because I think most people are growing kale in their home gardens and are struggling with ideas to prepare it for the family. I will have to admit it was fun watching my hubby take his last bites of this recipe and didn’t bother to ask what the green ingredient was. Sometimes it can be difficult to get him to eat the kale. I think I’ll tell him later tonight when I’m serving up the fresh watermelon that I had sauteed kale in brunch so I’ll keep you posted on his reaction. However, sometimes I think it is better to just keep on serving it up as long as they have a smile on their faces and the plate is empty. Below is the recipe I made up this morning featuring the kale from the garden. I hope you will give this dish a try and surprise your family this summer by growing your own and serving it up in their favorite dishes. 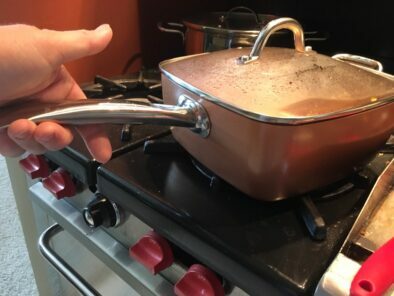 I have to note that I have NEVER made the most PERFECT egg omelet until today using this pan Copper Chef I was given in exchange for my honest opinion. The cookware didn’t even have oil in it with the egg and yet the cooked properly omelet slide right on out of the pan and onto the dish! Move first veggies to the side in skillet and add chopped kale that has been tossed in olive oil into the skilled and continue to saute about 2 minutes before mixing with the other veggies in skillet. Stir in fresh chopped prosciutto and saute in the veggie mix for about 3 minutes blending the flavors. Pour 1/2 of mix in hot skillet making sure it covers bottom of skillet. Put lid on to help cook the top of the egg mix. 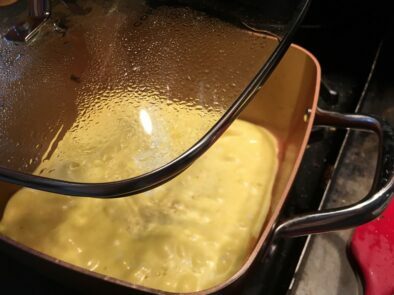 Watch so it doesn't burn - should take about 4-5 minutes to cook egg. 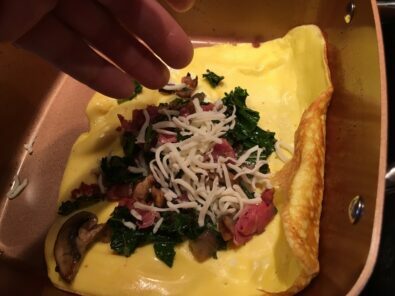 Once you are able to flip the omelet without it falling a part you can add 1/2 the saute veggie mix to one 1/2 of the egg omelet. Add 1/4 cup of cheese to top of saute veggies. 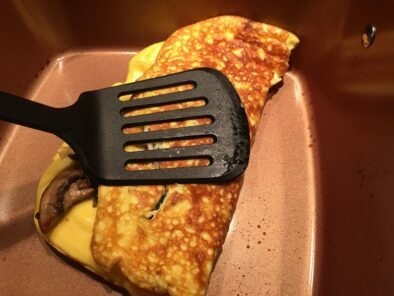 Flip 1/2 of omelet to close it and keep in skillet with lid on for another 1-2 minutes so the cheese can melt inside egg. 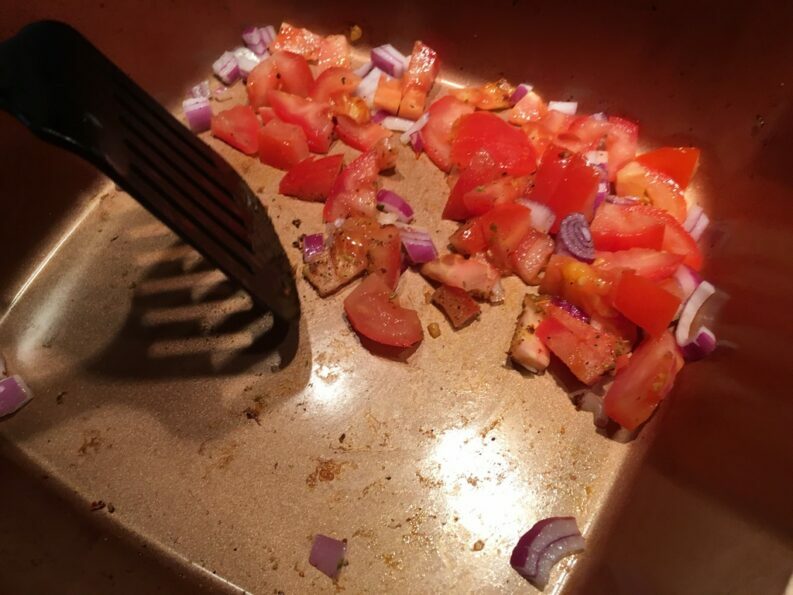 Add the remaining diced red onions and tomatoes to the hot skillet - saute for about 2 minutes. Sprinkle with salt if desired. spoon 1/2 the tomato / onion mix on top of each Omelet - sprinkle with Parmesan cheese before serving. Garnish with fresh basil from your garden! 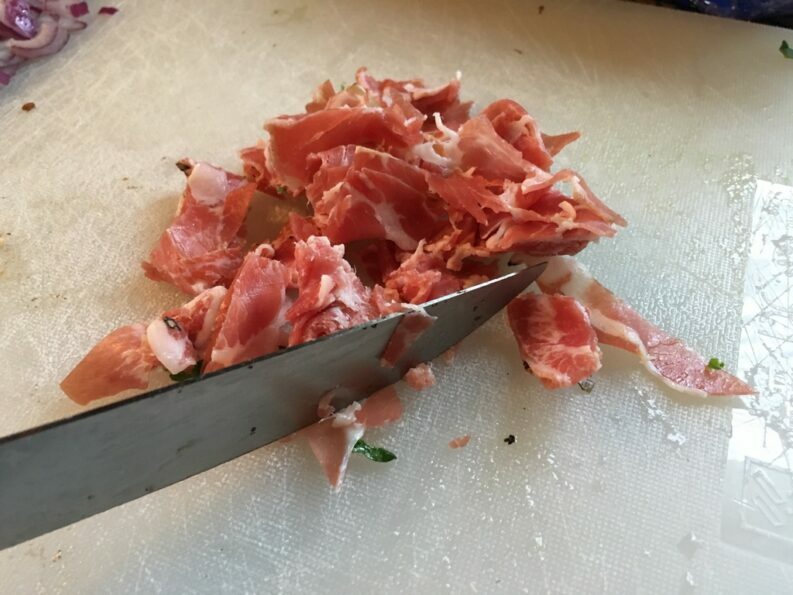 cutting the prosciutto up to add to the filling. 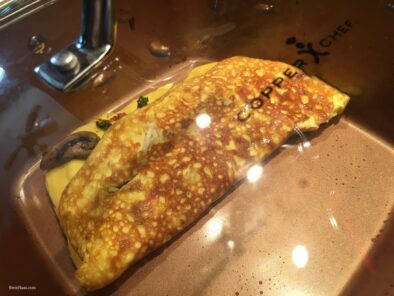 copper chef omlete – perfect ! Kale… love it or leave it behind? 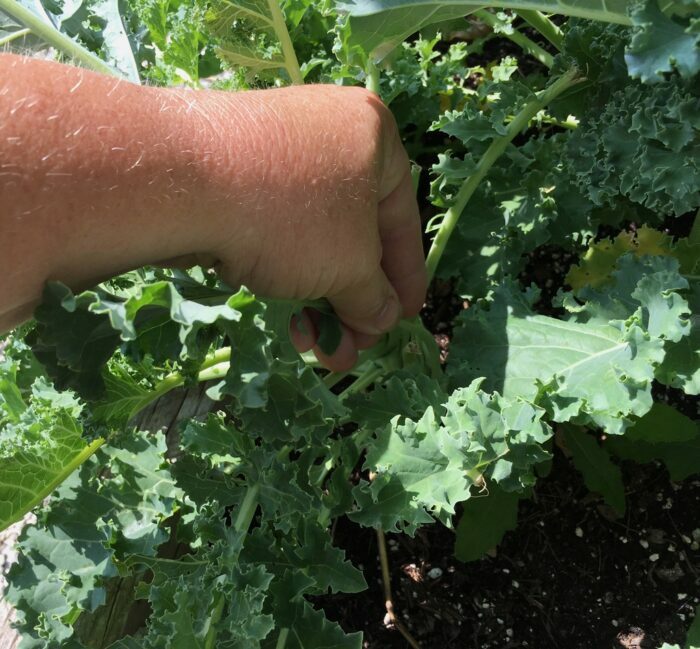 I’ve heard so many mixed reactions about kale but I’ll tell you after reading all the good stuff that is packed in this easy to grow green treat I can’t get enough of it. 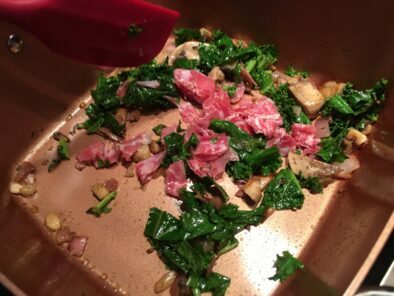 I hope you will take the time and comment below telling me what you think about the recipe and kale.